The Cumberland & Dumfriesshire Farmers Mart P.L.C. 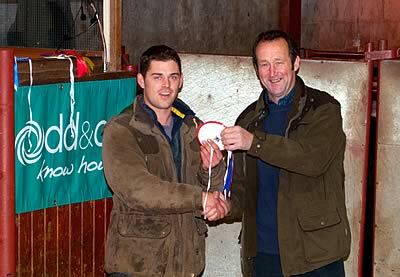 had forward 623 head at their Annual Hillbred Calf sale on Saturday 23rd October, 2010. The calves were met by a buoyant trade with as many as 48 active buyers and many more going home empty handed. 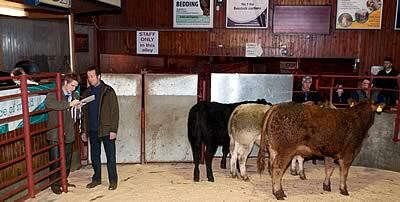 Judging was ably carried out by Mr. Jeff Story, who awarded the Jacob Thomlinson Challenge Trophy to a Limousin heifer from Mr. James Latimer, Rinnion Hills and later realised £850 to the judge. The reserve champion was also purchased by the judge, realising £760 for a Limousin steer from Mr W J Mitchell, Ryehill Park. Limousin bullock: 1st WJ Mitchell, Ryehill Park, 2nd & 3rd M/s Murray, The Throp. 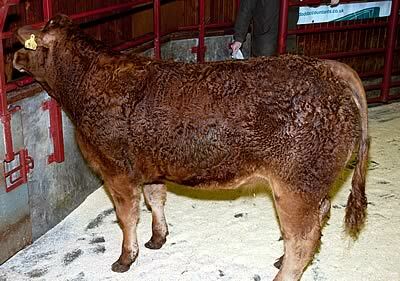 Limousin heifer: 1st J Latimer, Rinnion Hills, 2nd & 3rd W J Mitchell, Ryehill Park. Any other Continental bullock: 1st, 2nd & 3rd Greystoke Castle Farms. Auctioneer Ryan Roddan and the Judge Jeff Story, the cattle L to R are the Reserve Champion from John Mitchell, the Charolais is the 1st prize other Continental bullock from Greystoke Castle Farms. The highlight of the sale was an excellent run of 157 Charolais calves from Greystoke Castle Farms, with bullocks selling to £770 and averaging £626, with the heifers to £695 and averaging £561. Charolais: £815 Clement Leazes, £780 Riggfoot, £770 Greystoke Castle & Clement Leazes, £765 Greystoke, £755, £750, £745 Riggfoot. £710 Riggfoot & Greystoke. Limousin: £775 Holme House, £770 Rinnion Hills, £765, £760 Woodside, £760 Ryehill Park, £755 Rinnion Hills, £745 The Throp, £740 Standingstonerigg & The Throp. Charolais: £710, £700 Highparkfoot, £695 Greystoke Castle, £690 Highparkfoot & Clement Leazes; £680 Highparkfoot, £670 Clement Leazes, £655, £650 Greystoke, £640 Riggfoot. Limousin: £850 Rinnion Hills, £760, £660 Holme House, £620 Standingstonerigg, £600 Ryehill Park & Greystoke, £590 Ryehill Park, Greystoke & Cadgillhead. Charolais: £565, £545, £540, £530 Greenburn.